Mngcunube Development, a rural empowerment company, was established in the 1990s. From the start, its aim was to implement livestock improvement projects throughout the former Transkei, with mentors playing a crucial role. In 2006, the company introduced a system of village link persons (VLPs). “The mentors train selected local farmers and appoint them as service providers to fellow farmers. These VLPs then provide inputs at a mark-up and build their own small businesses,” explains Lyle Kew, founder and CEO of Mngcunube. This network has gone from strength to strength, with 12 VLPs being appointed in the past 18 months alone. 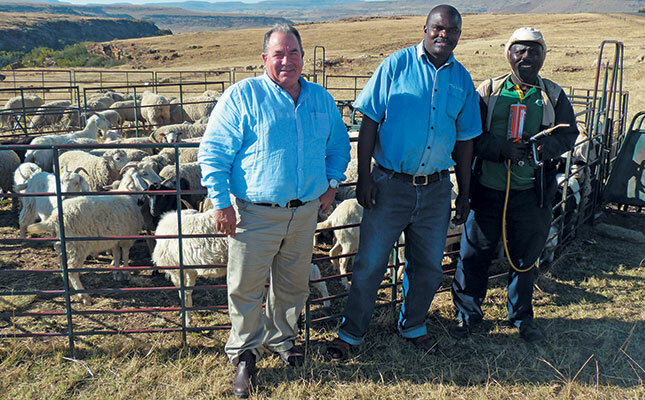 The company’s livestock improvement projects currently involve nearly 14 000 communal farmers in the former Transkei. “The increase in their livestock numbers is enough to earn the average farmer an extra income of about R20 000 a year,” says Mngcunube’s monitoring and evaluation manager, Jack Blaker. This is thanks to improved birth and survival rates. Farmers pay competitive prices for products distributed by the VLP network. From left: Lyle Kew (founder and CEO of Mngcunube), Bejile Wana (head of Mngcunube’s sustainability division),and Libalele Ngxongxela (village link person) pictured in the Elundini area between Maclear and Mount Fletcher. Although VLPs are crucial to the Mngcunube approach, the real hurdle when a livestock improvement project is launched is to change community attitudes to livestock production. According to Bejile Wana, the director of Mngcunube’s sustainability division, livestock in most communal areas of the Eastern Cape has never been appreciated as a serious income generator worthy of strategic investment, an attitude Mngcunube has attempted to address. According to Lyle, Mngcunube’s key focus is therefore to increase the value of communal livestock. Lyle adds that grinding poverty also has a psychological impact on communal farmers by extinguishing any hope of ever being able to escape their desperate reality. Nevertheless, he has found from his decades of development experience in the former Transkei that a little success can revolutionise the attitude and plight of hopeless farmers. Bejile believes it is Mngcunube’s reach into far-flung communities via the VLPs that is key to the sustainability of the livestock improvement projects. He says that the inability to create a realistic long-term presence in communities has proved to be the Achilles heel of many development initiatives he has seen failing in the former Transkei over the years. “When [other development initiative officials] want to speak to the people, they ask them to gather in the town hall, which is far away from their homes,’’ he explains. According to Bejile, a VLP needs about 20 villages to make his business sustainable and relates how the 42 VLPs (out of a total of 58) whom he works with earn at least R4 500 per month each. VLPs in Elundini visit a village once a month to inject and dose animals, as well as discuss issues such as supplementation, breeding (ewes are mated to lamb in September and October) and purchasing quality rams (sourced by Mngcunube and communal farmers from stud and commercial breeders). Requirements are then relayed to Bejile, who manages a depot for veterinary and other resources in Maclear. Although VLPs can source resources from whomever they want, Mngcunube is able to offer them reasonable pricing due to economies of scale. Libalele Ngxongxela (63), a VLP from Mount Fletcher, looks after the health of livestock, and works closely with up to 300 farmers. Like many of the VLPs, he travels to isolated villages on horseback. “We’ve been able to deal significantly with mortalities thanks to medication,’’ he explains, adding that veterinary products and other resources are stored in VLPs’ homes. his livestock to 150 sheep, 65 cattle and 28 goats. What’s more, the income he now generates as a VLP, combined with money generated from his livestock, ensures a reasonable living. “Being a VLP is a good business to have,’’ he says. Another VLP, Nelson Rasmeni (62) from Maclear in the Elundini area, owns 140 sheep and 12 cattle. Not owning a vehicle makes it more difficult, but not impossible, to reach his farmer clients, he says. Nelson recalls that he became involved in the Mngcunube livestock improvement project a number of years ago after witnessing the significant reduction in livestock mortalities in his community. The main production challenges facing communal sheep farmers are internal parasites (especially tapeworm and wireworm), pulpy kidney, sheep scab and red lice, he explains. Besides veterinary issues, Nelson advises communal farmers on the importance of using genetically superior rams in structured breeding seasons, as well as the cultivation of oats to support livestock in winter. Phone Lyle Kew on 083 262 0943 or email lyle@mngcunube.co.za. Phone Jack Blaker on 082 807 7805 or email jack@mngcunube.co.za.